When family owned Lodge Manufacturing considered the largest expansion in their 120 year history, they turned to a family owned partner, the John W. McDougall Company. With their Construction partner Vulcan Engineering, Lodge brought McDougall into the project from the design concept stage. This team had already worked successfully together on the Phase 1 Expansion, performed at Lodge’s existing facility on Railroad Avenue. With the new expansion being nearly twice as large as the Phase 1 project, Lodge wanted proven effectiveness across their entire design and construction team. As a design-build contractor, McDougall was able to provide conceptual design & engineering, construction drawings, fabrication, installation and final commissioning. 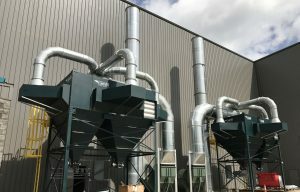 More and more Owners are seeing the merit in this “turn-key” approach to industrial ventilation and general sheet metal construction projects. On the Industrial Ventilation side, McDougall provided systems for the three major manufacturing areas of the new foundry. These areas include……. McDougall also supported the new installation with auxiliary ventilation systems including…. McDougall has supplied eight (8) new dust collection systems total (design-build systems including fabrication, installation and commissioning) to Lodge Manufacturing starting delivery in 2014 to the present.